Students, faculty, and guest enjoy the ambiance, great food, and presentations during the BSU Ball held March 23. The Black Student Union (BSU) welcomed all students, faculty, and staff to celebrate black excellence, held an African Ball in University Center on Saturday, March 23, 2019. It was asked for attendees to dress in African attire or all black as they celebrated. To put this event together, it required a lot of planning from the members of BSU. “We just wanted something different. This was a project we started planning in the summer but previous efforts fell through,” Black Student Union president, Ke-La Harris said. African-style music was played throughout the night. Jada Roberson encouraged all attendees to absorb the culture and knowledge shared throughout the night. “I want everything that goes on tonight to be ingrained in you,” she said. 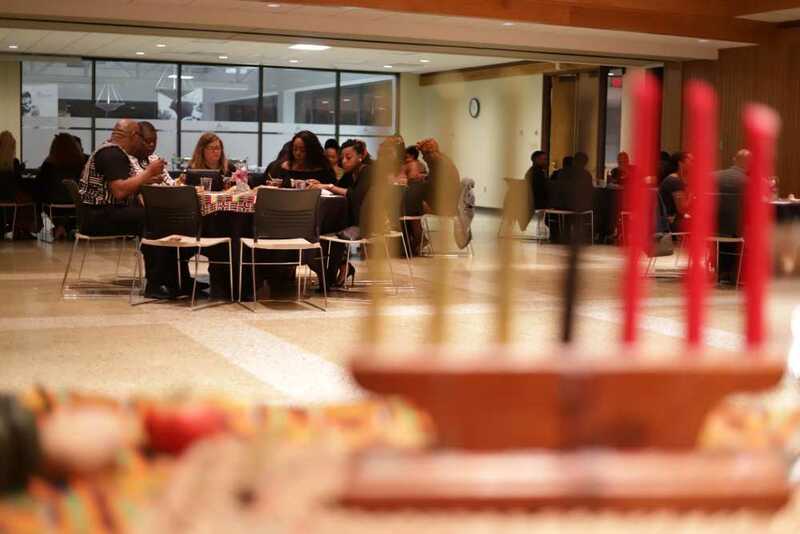 The BSU executive staff shared the meaning of Kwanzaa and how to properly display the candles, foods and other decorations according to their meaning in a typical household. To follow was the opening prayer by Minister Kathleen Gamble, mother of BSU vice president, Karis Gamble. Shonta Smith gave a speech that set the tone for the evening. “Don’t be afraid to stand in your greatness. You come from good stock. Good heritage. Each of you are great,” Smith said. A buffet-style dinner, provided by Chartwells, was served, allowing a break for people to eat and socialize. Some attendees took pictures in front of a backdrop covered in African-style prints. A video presentation documenting elements of the black experience was shown, titled, “Us.” A monologue was recited by Emmani Cunningham and the Southeast God’s Ensemble choir performed. Associate professor of mass media, Dr. Tamara Zellars Buck was the keynote speaker. Her message to the attendees was thriving on campus. “Elevate yourselves. Show you are a black intellectual. Think about how to carry yourself outside of the classroom and prepare yourself for inside the classroom,” she said. Many of the students and faculty had similar sentiments and expectations for the event, however, many had different backgrounds. A few members of the members of the Association of Black Journalists Southeast Chapter (ABJSE) attended the event to show solidarity with BSU, according to Noelle Williams, a Southeast student. Many of the attendees that attended the event were of different backgrounds and ages, although, mostly women. Southeast student Patrick Morehouse is passionate about resetting priorities among black students. There were many allies of a different race that attended the event. “It was even better. The student performances were amazing. It was really heartfelt. As a white ally, it’s important for the students to know that I’m comfortable being with them and that their comfortable being with me when they need me,” said Diana Rogers- Adkinson, dean of College of Education, Health and Human Studies. Although the event was the first of its kind at Southeast, the members of the Black Student Union and fellow students said they hoped the event would become an annual event.